Starting the day with a cup of tea is a ritual that many people in the world have. Are you one of them? If so, I would highly recommend that you get your tea press. Why? I’ll tell you this---nothing can match up with the flavor of tea produced from a tea press. Since tea leaves are fully immersed in the water and no essential oils are eliminated, you can expect a rich and flavorful beverage that you can’t get from any other brewing method. Before the advent of tea bags in the 19th century, steeping dried tea leaves was the only way to enjoy a cup of tea. The old way of brewing tea has gone a renaissance of sorts. There are now lots of tea press (which is also interchangeable with a French press) models that you can turn to in brewing tea and even coffee. A tea press can also be used for brewing coffee. It’s a must-have for any serious lover of these caffeine-rich beverages. There’s no complicated process involved in operating a tea press. You simply have to place the tea leaves in the pot then add hot water. Place the lid on the top and let the leaves steep. 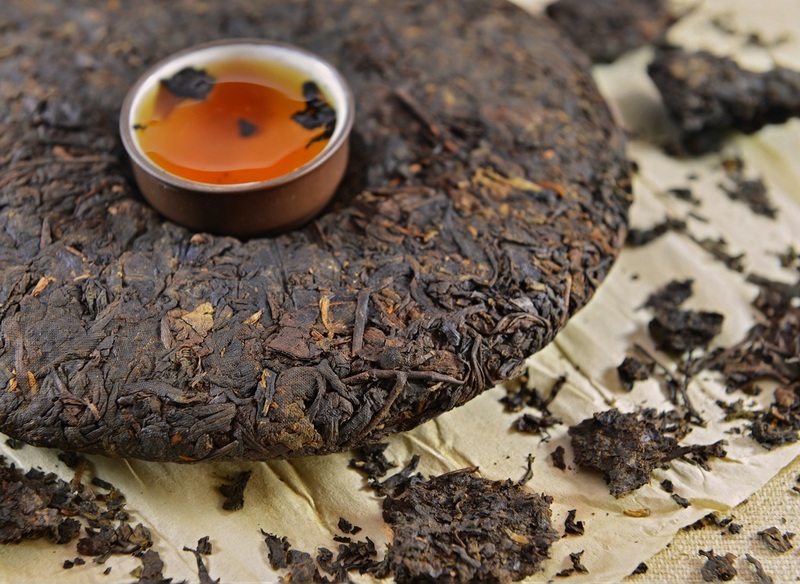 The amount of time that the leaves are steeped, and the water temperature can affect the strength of the brew. Tea will need less time for steeping than coffee. Thus, you can keep the leaves in the pot for about 1-2 minutes. After that, pour out the tea by pushing on the press button. This would utilize the filter as a sieve of sorts and separate the tea leaves from the liquid. A word of caution, though--- be gentle in squeezing the tea with a press as it could release bitter compounds into the beverage. It’s also basically the same process in brewing coffee. Add several coarse ground coffee into the pot then pour hot water. Let it brew for a few minutes. Hold the handle of the pot and press it down gently. You can then enjoy a cup of brewed coffee. Stainless steel tea press can last for a long time. Glass, too, is a good material as it is easy to clean. It also won’t retain flavor, unlike plastic. But plastic is the best material for tea presses designed for travel. Tea presses with a few parts and dishwasher-safe are your best bet here. This depends on your needs. 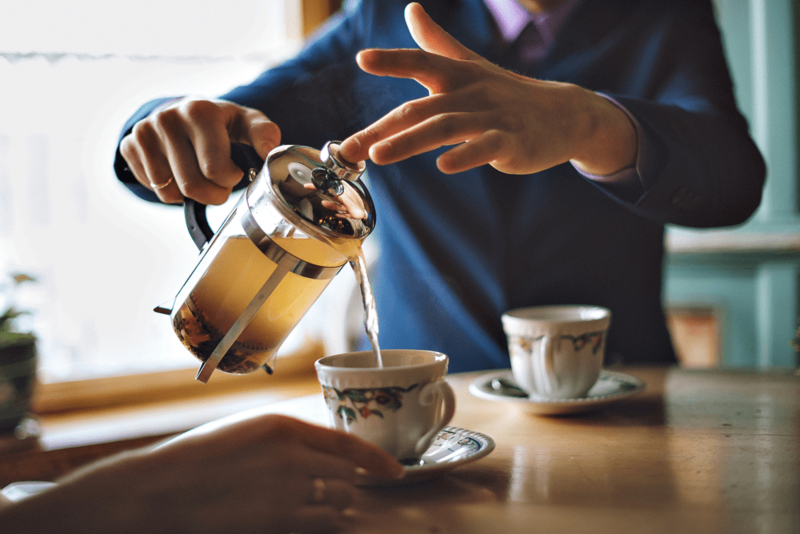 Are you the only one in your house that enjoys tea and coffee? Then a personally sized tea press is what you need. If you have 3 or more individuals in your household who love said beverages, then get a bigger tea press. Now I will take a look at five of the best tea presses today. I have sorted these tea presses according to use—at the office, at home, and for travelling. If you’re the tea or coffee purist who likes to have a cup or two of any of the caffeine-infused beverages at work, then I would suggest you get this French press. This X-Chef stainless steel French Press can brew a liter of the best tasting coffee or tea. The capacity is good enough for one to two individual coffee drinkers. It has a double wall construction and can thus keep coffee or tea warm for a long period--- around one hour. However, its exterior stays cool so you can touch it and pour coffee or tea anytime. I also love how this French Press is made. It has a very nice mirror finish outside so it can make any kitchen countertop look more stylish. Moreover, all the components of this French Press are dishwasher-safe thus you won’t need to spend a lot of time and effort in cleaning it. Do you want to enjoy great tasting coffee or tea at home? Check out this French press from Café Du Chateau. It has a four-level infiltration system that can be relied upon to make perfectly brewed coffee, tea, and espresso. This unit is made only from the finest quality materials. Every single metal in this unit is of superior quality and won’t rust. The carafe, meanwhile, is made of borosilicate glass. Despite being made of high-quality materials, this tea press is surprisingly lightweight. It weighs less than 2 pounds. It is also portable enough to fit in a backpack, then you can bring this on your next camping trip. Maintaining it won’t be a concern, too, as it is very easy to clean. The glass container, for one, easily slides out from the metal handle. The glass also feels solid so you won’t feel like it will break from a bit of scrubbing. This is another tea press that you would love to have at home. It’s not only reliable in making great tasting tea but also has that very distinctive look that can lend a touch of elegance to any kitchen. It has a 7 ounce clear glass teapot and a stainless steel infuser. It is both oven and stovetop-safe. This glass teapot can make tea for one to two individuals. It is also very lightweight so you can bring this from the countertop to the table. And because it is made of clear glass, it is possible for you to see the beautiful colors of your favorite teas with this teapot. It’s also easy to use. You simply have to drop the loose leaves into the infuser. Then pour boiled water through the infuser and into the teapot. You’ll see the tea gain color and expand. You can then pour the tea into a cup without any mess thanks to its non-dripping spout. This is highly recommended for loose leaf tea drinkers. It is compact, solidly built and easy to use. This tea maker measures 6.4 inches by 6 inches by 4.3 inches. It provides a very efficient and easy way to steep tea. Simply fill the tea maker with hot water and tea. Once the tea steeps, put the tea maker on top of the mug and drain it. You may even stop the unit from draining halfway. This is a four-piece unit that is easy to disassemble and reassemble for cleaning. While it is made of plastic, the tea maker is well-constructed. The material is also solidly built and doesn’t feel flimsy at all. This is the tea press that I would recommend if you want to enjoy freshly brewed coffee or tea while away from home. Measuring 10 inches long, 6 inches wide and 5.5 inches tall, this coffee maker can easily be placed in your backpack. It also won’t take up a lot of space in your suitcase. Aside from being very compact, it has a well-designed body. The outer shell is not only attractive but also insulated. It is strong and durable, too, and can protect the coffee maker from chips and cracks. The handle, on the other hand, is durable and sturdy. This coffee maker is also very easy to clean as it is dishwasher-safe. It won’t also disturb you wherever you may be as it is quiet when in operation. Before I wrap up, I would like to point out that the Black Teavana Perfectea Maker is my pick for home use. It is compact, solidly built, well designed and very easy to use. There you have it—five of the best tea presses that you can choose from. So what are you waiting for? Start shopping for a tea press now and enjoy perfectly brewed tea or coffee anytime you wish.